Department of Pharmacology, AISSMS College of Pharmacy, Savitribai Phule Pune University, Pune-411001, Maharashtra, India. ABSTRACT: Aim: The present investigation was carried out by evaluating the effect of protocatechuic acid (PCA) on a high-fat diet (HFD) along with a low dose of alloxan-induced hyperglycemia in male Wistar rats. Methods: In the present study, administration of high fatty diet (HFD) for 45 days along with low dose of alloxan (80 mg/kg) in rats on 30 days produced significant high fatty diet in the, body weight, low density lipoproteins (LDL), triglycerides (TG) and blood glucose levels while decreases the high density lipoprotein (HDL) and serum insulin level. Protocatechuic acid (PCA) was started to administered at a dose of 50, 100, 200 mg/kg (orally) on day 45 of HFD administration and continue further 45 days. Glibenclamide was used as reference standard. Results: Results of PCA shows a significant decreased in body weight, blood glucose level after 45 days of treatment in diabetic animals. Result also indicated to increase in serum insulin level. The result of lipid profile indicated to normalize after 45 days treatment with PCA in diabetic rats. All the results are compared with reference standard glibenclamide. Conclusion: From this result, it concludes that PCA decreases the body weight, blood glucose level dose-dependently indicated antidiabetic and antiobesity activity. Antidiabetic activity of PCA is associated with increased in the level of serum insulin. INTRODUCTION: Obesity is a metabolic disease of pandemic proportions mainly arising from positive energy balance, a consequence of sedentary lifestyle, conditioned by environmental and genetic factors. Obesity is characterized by the accumulation of excess fat in adipose tissues and results in various life upcoming complications such as cardiovascular diseases, Type 2 diabetes, and cancer 1. The modern lifestyle of increased intake of high-calorie cafeteria fast food associated with decreased energy expenditure also contributes to the current rising prevalence of obesity and type 2 diabetes 1, 2. Insulin resistance plays a primary role in the development of Type 2 diabetes and is a characteristic feature of other health disorders including obesity, dyslipidemia, hypertension, and cardiovascular disease 3. It is widely known that an elevation in circulating free fatty acid (FFA) levels impairs insulin action and leads to insulin resistance in animals and human 4. This may represent a physiologic mechanism of insulin resistance because elevated FFA levels are generally observed in most human insulin resistance states 5. The HFD causes insulin resistance in rats. The feeding of HFD produced insulin resistance syndrome in rats. It was characterized by the increased body weight (obesity), mild hypertension, hypertriglyceridemia, hypercholesterolemia and compensatory hyperinsulinemia 3, 4. It is therefore important to prevent or abate obesity. A growing number of enzymes involved in lipid metabolic pathways are being identified and characterized. They represent a rich pool of potential therapeutic targets for obesity. To reduce these serious complications and negative outcome of the metabolic syndrome, the control not only of blood glucose but also of lipids profile is necessary 5. Aim and Objective: In the current research, the study was aimed to investigate antiobesity, anti-hyperlipidemic and antidiabetic effect of proto-catechuic acid against experimentally high fatty diet (HFD) along with a low dose of alloxan-induced in the diabetic rat. Animals: 36 male Wistar rats weighing (180-220 g) were used for the study. The animals were kept in standard cages at room temperature with 12 h light/dark condition in the animal house of the Department of Ethical clearance for performing the experiments on animals was obtained from Institutional Animal Ethics Committee (IAEC) (Reg. CPCSEA/IAEC/PC-08/01-2K17). The animals were fed on a standard diet and had water ad libitum. Methods: Obesity and diabetes were induced by administration of high fatty diet (HFD) for 45 days along with a single low dose of freshly prepared in normal saline alloxan monohydrate 80 mg/kg by intraperitoneal injection(on 30 days) in Wistar rat. HFD Composition: The composition of a high-fat diet was considered as reported in the literature with appropriate modification. (6) Containing lard oil (25%), fructose (40%), protein powder (45%), cholesterol (2%), vitamin and fiber contains feed. n=6, Values are mean ± S.E.M., ###P<0.0001, as compared with 0 days reading of respective group; *P<0.05 compared to 45 days reading of respective groups. Data analyzed by one-way Analysis of Variance (ANOVA) followed by Tukey’s Multiple Comparison Test. n=6, Values are mean ± S.E.M., ###P<0.0001, as compared with 0 days reading of respective group; **P<0.001 compared to 40 days reading of respective groups. Data analyzed by one-way Analysis of Variance (ANOVA) followed by Tukey's Multiple Comparison Test. n=6, Values are mean ± S.E.M., ###P<0.0001, as compared to NC(Negative Control) to control group; ***P<0.0001, ***P<0.0001, ***P<0.0001, as compared to negative control, Data analyzed by one way Analysis of Variance (ANOVA) followed by Tukey's Multiple Comparison Test. DISCUSSION: Diabetes mellitus is a chronic disorder caused by partial or complete insulin deficiency or deficiency of insulin secretion 7. Obesity is more likely to increase the risk for hyperglycemia because of alteration in serum lipid profile like Serum Insulin level or blood glucose level 8. Generally, a high-fat diet is one of the major factors causing obesity and that the long-term intake of high-fat diet evokes a significant increase in abdominal fat weight. Protocatechuic acid (PCA) is a phenolic compound, the main metabolite of anthocyanin, which has been reported to display various pharmacological properties 7. In the present investigation, we proposed the hypothesis that PCA exerts antiobesity, antihyperlipidemic, antidiabetic effects in the high fatty diet with a low dose of alloxan-induced in diabetic rats 8, 9, 10, 11. In light of this, the present study was undertaken to evaluate the effects of PCA on body weight, lipid profile and blood glucose level in the high fatty diet with a low dose of alloxan-induced body weight in diabetic rats 12, 13, 14, 15, 16. Results of the present study indicated increased in body weight, and blood glucose level in the high fatty diet with a low dose of alloxan shows induction of obesity and diabetes on 45 days of study as compared to normal control animals 17. 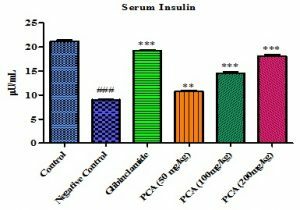 Results of 45 days of oral administration of PCA indicates the decreased in body weight and normalization of blood glucose level demonstrates antiobesity and antidiabetic activity investigation 7. The results suggest that insulin resistance and hyperinsulinemia are not induced in the excessive weight gain observed in their animal model. The decline in the level of insulin reflect difficult in the secretion of insulin because of degeneration of Langerhans cell indicates induction of type II model as indicated in the histopathology of pancreas 18, 19, 20, 21. Other factors which may contribute to the increased in obesity and diabetes are altered of lipid profile. Considering the high lipid profile is risk factors in the development of obesity and complication in diabetes, the study further was undertaken to measure the level of LDL, HDL, triglycerides level 22. The results of the study indicate to increase in the level of lipid profiles due to consumption of high fatty diet contributes in the development of obesity 23, 24. While the 45 days of treatments with PCA indicates to significantly decreased in the LDL, triglycerides and elevates the level of HDL, these results reflects the preventing rate in development of cardiovascular complication as well as antiobesity in diabetic rats activity of protocatechuic acid in the high fatty diet with a low dose of alloxan-induced diabetic rats 25. CONCLUSION: From this finding, it concludes that protocatechuic acid possesses antiobesity, anti-hyperlipidemic and anti-diabetic activity as reflected by a decline in body weight, blood glucose and normalization of lipid profile in HFD along with the single low dose of alloxan included diabetic rats. So, it would help treat obesity and its associated condition such as diabetes and its cardiovascular complication. ACKNOWLEDGEMENT: The authors are thankful to All India Shivaji Memorial Society College of Pharmacy, Pune - 411001 for valuable support for this work and for providing the animal housing facilities to perform the animal studies. CONFLICT OF INTEREST: The authors do not have any conflict of interest to declare. Devalaraja S and Jain S: Exotic fruits as therapeutic complements for diabetes, obesity and metabolic syndrome. Food Research International 2011; 44: 1856-1865. Nammi S and Sreemantula S: Protective effects of ethanolic extract of Zingiber officinale rhizome on the development of metabolic syndrome in high-fat-diet-fed Basic & Clinical Pharmacology & Toxicology 2009; 104: 366-373. Reaven GM, Hollenbeck C, Jengk CY, Wu MS and Chen YD: Measurement of plasma glucose, free fatty acid, lactate and insulin for 24 h in patients with NIDDM. Diabetes 1988; 37: 1020-1024. Boden G: Role of fatty acids in the pathogenesis of insulin resistance and NIDDM. Diabetes 1997; 46: 3-10. Ling LI, Gangyi Y, Qingming LI and Tang YI: High fat and lipid-induced insulin resistance in rats: The comparison of glucose metabolism, plasma resisting and adipopectin Ann Nutr Metab 2006; 50: 499-505. Tembhurne SV and Sakarkar DM: Anti-obesity and hypoglycemic effect of ethanolic extract of Murraya koenigii (L) leaves in high fatty diet rats. Asian Pacific Journal of Tropical Disease 2012; 2(1): S166-S168. Tabit CE and Chung WB: Endothelial dysfunction in diabetes mellitus: Molecular mechanisms and clinical implications. Rev Endocr Metab Disord 2010; 11(1): 61-74. Gutierrez RMP and Ahuatzi DM: Ameliorative effect of hexane extract of Phalaris canariensis on high fat diet-induced obese and streptozotocin-induced diabetic mice. Evidence-Based Complementary and Alternative Medicine 2014; Article ID 145901: 1-13. Harini R and Pugalendi KV: Antioxidant and antihyperlipidemic activity of protocatechuic acid on streptozotocin diabetic rats. Redox Report 2013; 15(2): 71-80. Shah DI and Singh M: Possible role of Akt to improve vascular endothelial dysfunction in diabetic and hyperhomocysteinemic Molecular & Cellular Biochemistry 2007; 295: 65-74. Tantipaiboonwong P and Pintha K: Anti-hyperglycemic and anti-hyperlipidemic effects of black and red rice in streptozotocin-induced diabetic rats. Science Asia 2017; 43: 281-288. Borate AR and Suralkar AA: Antihyperlipidemic effect of protocatechuic acid in fructose Induced hyperlipidemia in rats. 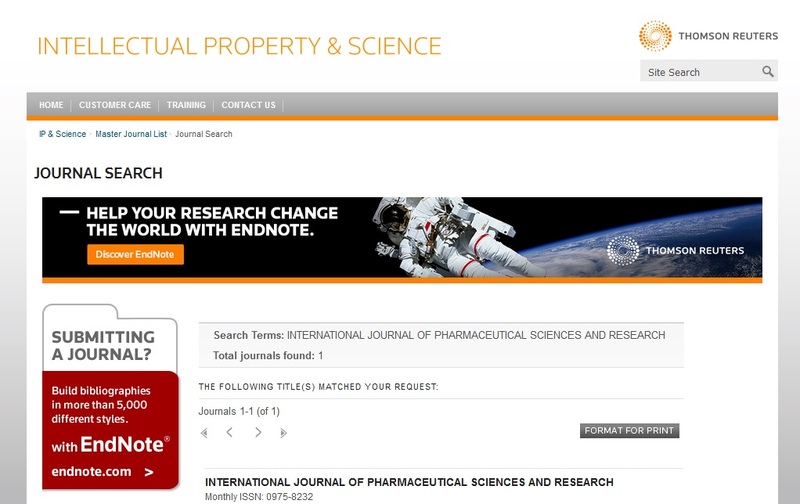 International Journal of Pharma and Bio Sciences 2011; 2(4). Nagarchi K and Ahmed S: Effect of streptozotocin on glucose levels in albino Wister rats. J Pharm Sci & Res 2015; 7(2): 67-69. Phoboo S and Shetty K: In-vitro assays of the anti-diabetic and antihypertensive potential of some traditional edible plants of Qatar. Journal of Medicinally Active Plants 2015; 4: 3-4. Safaeian L and Hajhashemi V: The effect of protocatechuic acid on blood pressure and oxidative stress in glucocorticoid-induced hypertension in the rat. Iranian Journal of Pharmaceutical Research 2016; 15: 83-91. Nevelsteen I, den Bergh AV and der Mieren GV: NO-dependent endothelial dysfunction in type II diabetes is aggravated by dyslipidemia and hypertension, but can be restored by angiotensin-converting enzyme inhibition and weight loss. Jour of Vascular Research 2013; 50: 486-97. Rohilla A and Ali S: Alloxan-induced diabetes: Mechanisms and Effects. International J of Research in Pharmaceutical & Biomedical Sciences 2012; 3(2): 819-23. Lachin T and Reza H: antidiabetic effect of cherries in alloxan-induced diabetic rats. Recent Patents on Endocrine, Metabolic & Immune Drug Discovery 2012; 6: 67-72. Parthiban P, Ravikumar, and Anbu J: Antidiabetic activity of Kovai kizhangu chooranam in alloxan-induced diabetic rats. IJLPR 2012; 2: 68-72. Chaurasia S and Saxena RC: Antidiabetic activity of Luffa aegyptica (Mill) in alloxan-induced diabetic rats. J Chem Pharm Res 2011; 3(2): 522-525. Akuodor GC, Udia PM, Bassey A, Chilaka KC and Okezie OA: Antihyperglycemic and antihyperlipidemic properties of aqueous root extract of senegalensis in alloxan induced diabetic rats. J of Acute Disease 2014; 3(2): 99-103.
Cooper ME, Bonnet F, Oldfield M and Jandeleit-Dahm K: Mechanisms of diabetic vasculopathy: An overview. Am J Hypertension 2001; 14: 475-486. Rahimi R, Nikfar S, Larijani B and Abdollahi M: A review on the role of antioxidants in the management of diabetes and its complications. Biomed Pharmacother 2005; 59: 365-73. Rahimmanesh I, Shahrezaei M and Rashidi B: High blood pressure and endothelial dysfunction: effects of high blood pressure medications on endothelial dysfunction and new treatments. 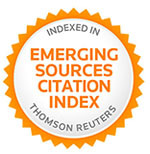 Journal of Research in Medical Sciences 2012; SI-2: 298-311. Kumar S and Singh R: Acute and chronic animal models for the evaluation of anti-diabetic agents. Cardiovascular Diabetology 2012; 11(9): 1-13. Rajguru M, Tembhurne S and Kolhe S: Antiobesity, antihyperlipidemic and antidiabetic agents of proto-catechuic acid in high fatty diet along with alloxan induced diabetes. Int J Pharm Sci & Res 2019; 10(4): 1741-46. doi: 10.13040/IJPSR.0975-8232.10(4).1741-46.